The club meets monthly to discuss business old and new! It also sponsors many events throughout the year such as the Hamfest, Field Day, and many other Public Service and Emergency Readiness Events to bring awareness of the importance of amateur radio communications to the public. It is a club of friendly, knowledgeable individuals who’s age varies from 18 to 90 and above! If you are looking for a place to learn, share, laugh, and have fun with amateur radio then this is the place to be! Come to our events or submit an application today to be apart of a great hobby with our premier members today! The RF Hill Amateur Radio Club was founded in 1965 and is dedicated to the hobby of amateur radio and its continued advancement and value to the public. 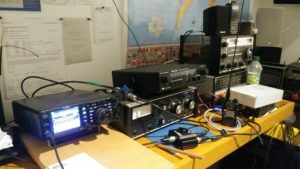 The RF Hill Amateur Radio Club is run under the guidelines of the American Radio Relay League “the national association for Amateur Radio”, which has become the guideline standard of the hobby. It supports and adheres to the part 97 regulations set forth FCC concerning amateur radio.